The Museum of Lost Wonder is a book with a mission, simply stated: To illuminate life's mysteries. The execution is nearly indescribable. Think McSweeney's production values and design pyrotechnics. Think traditional esoteric symbols in a childhood garden of wonder. Think graphic novel and an adult version of the coolest activity book ever made. And you'll be somewhere in the neighborhood. Jeff Hoke has created a history of the human imagination with visual cues and clues and wonderment about and around everything you ever thought and everything you wish you'd been crafty enough to think. He has built a museum accessible to all, in book format, arranged with 7 halls (representing the seven stages of alchemical process) in which the questions of the universe unfold. All one needs to enter is some basic understanding of the human experience. Open The Museum of Lost Wonder, and step into an alternative world full of beautiful drawings, interesting historical tidbits, thoughtful challenges to common myths, and projects and pursuits to complete at home. Pages pull out with cutouts for building models. 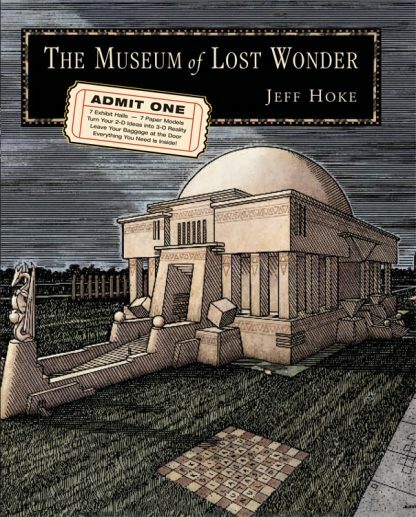 Hoke's museum is graphic novel meets quantum physics meets mythical journey meets spirit. Hoke begins with The Calcinatio Hall where the featured exhibit is The Beginning of Everything and leads us into halls like The Sublimatio Hall, with the exhibit How To Have Visions. In The Separatio Hall the exhibit Where Are You Going challenges us in our own journey. Through each hall we are led into an exhibit that questions our own understanding of life and urges us into new ways of thinking. As in wandering the great, immense halls of an ancient museum with endless corridors and fascinating exhibits, the reader is instantly pulled into this enormously imaginative pursuit. Each page is full of depth and questions. And each hall features a special fold-out interactive page. The Museum of Lost Wonder is a ray of hope in a dreary world. It is an oasis in an age when we are inundated everywhere we go with messages of consumption and materialism. It is an invitation into the imagination of a brilliant artist as well as a welcome back into your own imagination. It is a call to challenge your mind and your mind's eye to re-assess what you believe to be true and what you know to be true. Once you enter the museum, there is no turning back. For the price of admission you get a whole new perspective on the meaning of life and your purpose in it.